If you wish to follow this post executing scripts or test it yourself, below is the description of what we are using here. We use DB AdventureworksDW2016CTP3 and we use COMPATIBILITY_LEVEL setting to test SQL Server 2014 behavior (CE 120) and SQL Server 2016 behavior (CE 130). We are talking about estimations and we don’t actually need to execute the query, so don’t press “Execute” in SSMS otherwise a server will cache the query plan and we don’t need this. To compile a query and not to cache it, just press “Display Estimated Execution Plan” icon or press CTRL + L in SSMS. Finally, we will switch to the AdventureworksDW2016CTP3 DB and clear server cache, I assume all the code below is located on the test server only. During databases evolution (about half a century now) there were a lot of approaches how to estimate a JOIN, described in numerous research papers. Each DB vendor makes its own twists and improvements to classical algorithms or develops its own. In case of SQL Server these algorithms are proprietary and not public, so we can’t know all the details, however general things are documented. With that knowledge, and some patience, we can figure out some interesting things about the join estimation process. If you recall my blog post about CE 2014 you may remember that the estimation process in the new framework is done with the help of such things as calculators – algorithms encapsulated into the classes and methods, the particular one is chosen for the estimation depending on the situation. Let’s switch to CE 120 (SQL Server 2014) using a compatibility level and consider the following query. The first one is used in the new CE in SQL Server 2014 and 2016 by default. The second one is used by the earlier CE mechanism. This is a general algorithm that gives an idea about how it works. As I have already mentioned, real algorithms are proprietary and not publicly available. Coarse Histogram Estimation is a new algorithm and less documented, even in terms of general concepts. It is known that instead of aligning histograms step by step, it aligns them with only minimum and maximum histogram boundaries. This method potentially introduces less CE mistakes (not always however, because we remember that this is just a model). Now we will observe how it looks like inside SQL Server, for that purpose, we need to attach WinDbg with public symbols for SQL Server 2016 RTM. The breakpoint on the method CHistogramWalker_Coarse::ExtractStepStats is reached twice while optimizing the query above, because we have two histograms that are used for a join estimation and each of them are aligned in the coarse manner described above. To take a step further, I also put a break point on the method CHistogramWalker_Coarse::FAdvance, which is also invoked twice, but before the ExtractStepStats, doing some preparation work. I stepped through it and examined some processor registers. Now let’s ask DBCC STATISTICS for the histogram statistics for the table’s FactInternetSales join column, in my case this statistic is named _WA_Sys_00000004_276EDEB3. Look at the very first histogram row of the column that contains rows equal to the histogram upper boundary. This is the exact rounded value that was loaded by the method CHistogramWalker_Coarse::FAdvance before step estimation. If you spend more time in WInDbg you may figure out what exactly values are loaded then and what happens to them, but that is not the subject of this article and in my opinion is not so important. More important is the knowledge that there is a new default join histogram estimation algorithm that uses the minimum and maximum boundaries and it really works in this fashion. Finally, let’s enable an actual execution plan to see the difference between actual rows and estimated rows, and run the query under different compatibility levels. As we can see both CE 120 (SQL Server 2014) and CE 130 (SQL Server 2016) use Coarse Alignment and it is an absolute winner in this round. The old CE underestimates about 30% of the rows. There are two model variations that may be enabled by TFs and affects the histogram alignment algorithm by changing the way the histogram is walked. Both of them are available in SQL Server 2014 and 2016, and produce different estimates, however, there is no information about what they are doing, and it is senseless to give an example here. I’ll update this paragraph if I get any information on that (If you wish you may drop me a line and I’ll send you those TFs). In the previous section we talked about a situation when SQL Server uses histograms for the join estimation, however, that is not always possible. There is a number of situations, for example, join on multiple columns or join on mismatching type columns, where SQL Server cannot use a histogram. Before we start looking at the examples, I’d like to mention once again, that this is not a complete description of the join estimation behavior. The exact algorithms are proprietary and not available publicly. They are more complex and covers many edge cases which is hard to imagine in simple synthetic tests. That means that in a real world there might be the cases where the approaches described below will not work, however the goal of this article is not exploring algorithms internals, but rather giving an overview of how the estimations could be done in that or another scenario. Keeping that in mind, we’ll move on to the examples. Table FactInternetSales has cardinality 60398 rows, table FactResellerSalesXL_CCI has cardinality 11669600 rows. Both tables have composite primary keys on (SalesOrderNumber, SalesOrderNumber). The query joins two tables on their primary keys (SalesOrderNumber, SalesOrderNumber). In that case we have two columns equality predicate, and SQL Server can’t combine histogram steps because there are no multi-column histograms in SQL Server. Instead, it uses Simple Join on Distinct Count algorithm. Let’s switch to the message tab in SSMS and observe the estimation process output. The interesting part is a plan for selectivity computation. Now, the minimum of the two densities is taken as a join predicate selectivity. To get the join cardinality, we simply multiply two base table cardinalities and a join predicate selectivity (i.e. minimum density). We got an estimate of 60397.8 rows or if we round it up 60398 rows. Let’s check with the TF output and with the query plan. The more interesting case is when SQL Server uses multicolumn statistics for the estimation, but there is no unique constraint. To look at this example, let’s compile the query similar to the previous one, but join FactInternetSales with the table FactInternetSalesReason. The table FactInternetSalesReason has a primary key on three columns (SalesOrderNumber, SalesOrderLineNumber, SalesReasonKey), so it also has multi-column statistics, but the combination (SalesOrderNumber, SalesOrderLineNumber) is not unique in that table. Parent calculator is still the same Simple Join On Distinct Counts, one sub-calculator is also the same, but the second sub-calculator is different, it is CDVCPlanLeaf with one multi-column stats available. This time it will be the density from FactInternetSales – 1.655684E-05. This is picked as a join predicate selectivity, and now multiply base cardinalities of those tables by this selectivity. Let’s check with the results from SQL Server. The query plan will show you also 64515 rows estimate in the join operator, however, I’ll omit the plan picture for brevity. This time both sub-calculators are CDVCPlanLeaf and both of them are going to use 2 single-column statistics. SQL Server should somehow combine those statistics to get some common selectivity for the multi-column predicate. The next part of the output shows some computation details. Two histograms (and in fact not only histograms, but the density vectors also) loaded for two columns, those statistics have ids 2 and 9 (# 1). Let’s query sys.stats to find them and look into. We see two densities for the two columns. The density is a measure of how many distinct values there are in the column, the formula is: density = 1/distinct_count. So to find distinct_count we use distinct_count = 1/density. This is what we see in the computation output # 2. Now SQL Server uses independency assumption, if we have 6 different CurrencyKeys and 10 different SalesTerritoryKeys, then how many unique pairs we may potentially have? It’s 6*10 = 60 unique pairs. So the combined distinct count is 60, as we can see in the output # 3. The similar math is then done for the second table, I will omit the computation, just show the result. So far we have: 60 distinct values for the first table and 50 distinct values for the second one. Now we’ll get the densities using the formula described above density = 1/distinct_count. Again, like we have done before, pick the minimum one: 0.0166666666666667 or rounded up to 7 digits 0.1666667. This will be the join predicate selectivity. If we round up 61258671.5000001225173430 it will be 61258700. Now let’s check with SQL Server. You see that the selectivity and rounded cardinality match with what we have calculated manually. Now move on to the next example. It is possible to use distinct values when there is an equality predicate, because the distinct count tells us about how many unique discrete values are in the column and we may somehow combine the distinct count to model a join. If there is inequality predicate there is no more discrete values, we are talking about the intervals. In that case SQL Server uses calculator CSelCalcSimpleJoin. The algorithm used for a simple join respects different cases, but we will stop at the simplest one. The empirical formula for this case is: join_predicate_selectivity = max(1/card1; 1/card2), where card1 and card2 is a cardinality of the joining tables. To demonstrate the example, we will take the query from the previous part and replace equality comparison with an inequality. Not very informative, though you may notice a few interesting things. First of all, the new calculator CSelCalcSimpleJoin is used instead of CSelCalcSimpleJoinOnDistinctCounts. The second is the selectivity, which is rounded maximum of: max(1/Cardinality of FactInternetSales; 1/Cardinality of FactResellerSalesXL_CCI). We’ll now move on to the next calculator, new in SQL Server 2016 and CE 130. If we compile the last query under 120 compatibility level and 130 we will notice the estimation differences. I will add a TF 9453 to the second query, that restricts Batch execution mode and a misleading Bitmap Filter (misleading only in our demo purposes, as we need only join and no other operators). To be honest, we may add this TF to the first one query also, though it is not necessary. (Frankly speaking this TF is not needed at all, because it does not influence the estimate, however, I’d like to have a simple join plan for the demo). Eleven million rows for the CE 120 and half a million for CE 130. If we inspect the TF output for the CE 130, we will see that it doesn’t use calculator CSelCalcSimpleJoin, but uses the new one CSelCalcSimpleJoinWithUpperBound. You may also note that as a sub-calculator it uses already familiar to us calculator CSelCalcSimpleJoinWithDistinctCounts, described earlier, and this sub-calculator uses single column statistics. 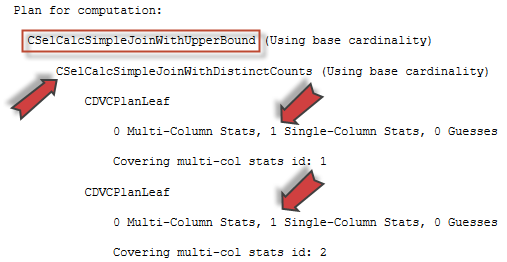 If we look further, we will see that the statistics is loaded for the equality part of the join predicate on columns SalesOrderNumber for both tables. Which equals to what we see in the output after round up. There is no need to combine distinct values here, because the equality part contains only one equality predicate (s.SalesOrderNumber = sr.SalesOrderNumber), but if we had condition like: join … on a1=a2 and b1=b2 and c1<c3, then we could combine distinct values for the part a1=a2 and b1=b2 to calculate its selectivity. Both CE heavily overestimates. However, the 130 CE is closer to the truth. There is a TF that forces the optimizer to use Simple Join algorithm even if a histogram is available. I will give you this one for the test and educational purposes. TF 9479 will force optimizer to use a simple join estimation algorithm, it may be CSelCalcSimpleJoinWithDistinctCounts, CSelCalcSimpleJoin or CSelCalcSimpleJoinWithUpperBound, depending on the compatibility level and predicate comparison type. You may use it for the test purposes and in the test enviroment only. There is a lot of information about join estimation algorithms over the internet, but very few about how SQL Server does it. This article showed some cases and demonstrated its maths and internals in calculating joins cardinality. This is by no means a comprehensive join estimation analysis article, but a short insight into this world. There are much more join algorithms, even if we look at the calculators: CSelCalcAscendingKeyJoin, CSelCalcFixedJoin, CSelCalcIndependentJoin, CSelCalcNegativeJoin, CSelCalcGuessComparisonJoin. And if we remember that one calculator can encapsulate several algorithms and SQL Server can even combine calculators – that is a really huge field of variants. I think you now have an idea how the join estimation is done and how subtle differences about predicate types, count, comparison operators influence the estimates.